In my fifth semester as an adjunct at Lipscomb University, teaching University Writing, I have been guiding my students for the last few weeks on a look back at their "literacy journeys." They have reflected on how they learned to read and write--and in far too many cases, how they lost their love for reading. As long as I have taught, I have been particularly interested in how to preserve or rekindle the love for pleasure reading. When I ask students when they quit loving reading, two themes emerge: the Accelerated Reader (AR) program and force-feeding of assigned books, followed by objective tests over the minutia. Conversely, when I ask the ones who love to read about their positive influences, they invariably mention parents who read aloud to them and teachers whose own passion for books and for students rubbed off on them. I can honestly admit that sometimes I resisted required reading. (The Scarlet Letter and Billy Budd the Sailor come to mind.) Even some of my best students admitted to reading just enough to pass the test, although one of my most clever students said she finally read the ones she'd skipped--after graduation. They were great, she admitted. This week, I've held conferences with students, looking over their drafts together before the final essay is due. The titles that keep coming up are often books I've loved--Little Women, Pride and Prejudice, The Things They Carried, Nancy Drew mysteries, the Harry Potter series. Some of the books they read weren't around when I was younger--The Magic Treehouse series, Geronimo Stilton, Percy Jackson. In a happy coincidence, my thirteen-year-old granddaughter called me while I was still on campus to tell me her teacher had given them a list of classics from which to make a selection. She was so excited and wanted my advice (and access to my book stack.) I couldn't wait to get home and comb through my shelf and bring her a sack of books. I'm hoping she might choose Little Women, the first classic I remember reading, one I haven't read in so long that I've already been thinking of reading it again. 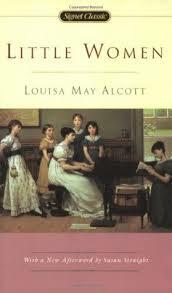 In fact, in my car's CD player, I'm listening to Anne Boyd Rioux's Meg, Jo, Beth, and Amy: The Story of Little Women and Why It Still Matters. Maybe while I'm at it, I'll write a thank you note to Margaret Epperson, my elementary school librarian and my earliest mentor other than family members. I'd better get busy now. In a few days, I'll have 63 essays to read.